‘Neeta Lulla Reserve Collection’ had long flowing dresses in out of the world gold embellishment and intricate textures. There was also detailing ornate hand work of a mix of gota and crystal on tulle and silk. All-gold is something that one can go so wrong with. But Neeta Lulla’s collection inspite of being all nudes and golds and looked extremely elegant. I loved how she broke all-gold with emerald in the earrings. Her collection ended with the gorgeous Aditi Rao Hyadri as the showstopper wearing a long and sheer gold embroidered kurti and gold sequined pants. On the second day of Blenders Pride Fashion Tour 2014, Little Shilpa was the first one to present her collections Disco Denimals, Grey Matters and Black Magic. Her headpieces were extremely exciting as always. 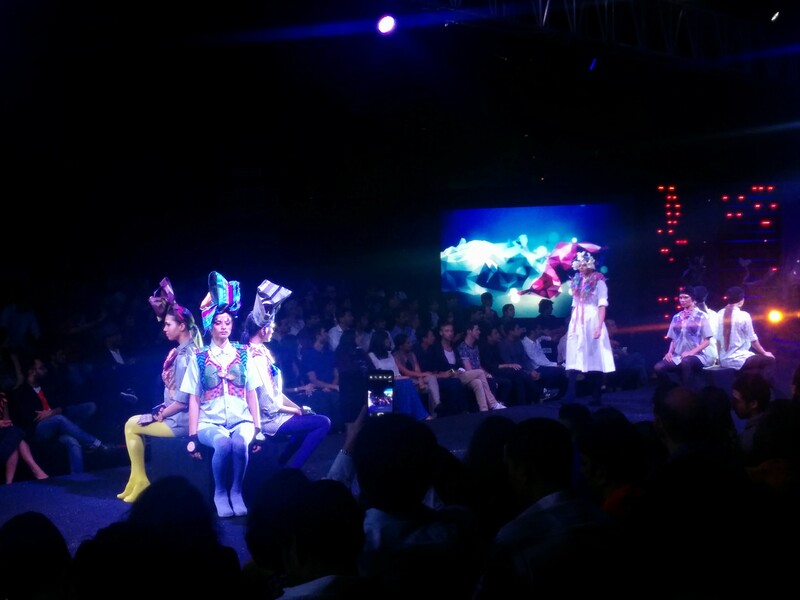 She played with the relaxed character of denims and teamed them up with some crazy headgears. Post the show she told us that all her pieces are hand-made and hand-crafted. I absoloutely adored the idea of ‘katoricholi’ on shirt which was so quirky. The choreography for her collection was quite unconventional with models sitting on chairs placed in the middle of the ramp. Also, models helping undo or loosening the dress strings for another model...all on the ramp. Very interesting. Stockings over shoes was again a great style statement. Throughly enjoyed this one! Then came in Shivan & Narresh with their chic and super edgy resort wear collection. It was luxury swimwear/resort wear with a high dose of glamour. Color blocked swimsuits in jewel tones of ruby, topaz, cerulean and rose made the collection extremely stylish. The most interesting part of the collection was ‘bikini-sari’ with pockets. Post the show, the designer duo told us how the ‘bikini-sari’ was conceptualized for an elderly customer who was not sure about wearing a swimsuit or bikini and wanted something more covered yet holiday and resort appropriate. Like they say, ‘necessity is the mother of invention’...this is just the perfect invention by Shivan & Narresh for a lot of women who prefer wearing something more covered to a beach holiday. So the bikini-sari was the interesting part and the best part was Sushmita Sen as their showstopper wearing a hot red bikini-sari and looking super ravishing. And this brought us to the end of two very exciting days. Cant wait to see whats in store for next year at the Blenders Pride Fashion Tour !! !